So other than that I had a fairly quiet evening at home. Read my book a little, had a lovely hot bath, Woolies yummy soup for dinner and a little Scrubs Season 6 to keep me entertained. Varen did pop in for a little visit - he was supposed to be working an all-nighter last night and tonight. But he managed to finish earlier than expected last night and popped round on his way home :) A nice surprise. 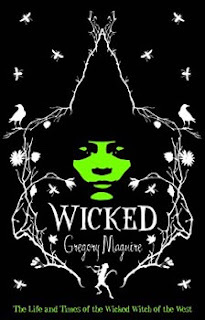 Oh, and this weekend I finished reading Wicked by Gregory Maguire (finally!). Unlike the popular 1939 movie and Baum's writings, this novel is not directed at children. It contains language and content which catches some readers by surprise. Wicked, the hit Broadway musical based upon the novel, is also very different in tone from Maguire's book. Alright, I'll start by saying that this book took me an inordinately long time to read ... and I'm not convinced it was purely because I took it on holiday with me and was saving it for my flight. Even once home, I've struggled thru it. Maybe I didn't remember the basic story of The Wizard of Oz well enough, but even on it's own this book is draining. It is a complex (and not terribly interesting) book with many very odd characters that I just couldn't bond with. Apparently it's supposed to be "a political, social, and ethical commentary on what good and evil really are" - obviously I just didn't get it at all. And for the life of me I cannot imagine what the musical must be like! It's a pity really because I had quite high hopes for it based on the back-cover blurb (above). But I just honestly wouldn't recommend this to anyone.